GROHE tall basin taps are created with your comfort in mind. The height and projection of the spout ensures that the water is delivered in the perfect position. A vessel basin can be a striking addition to all styles of bathroom, with glass, wood, metal and composite materials all being popular choices. 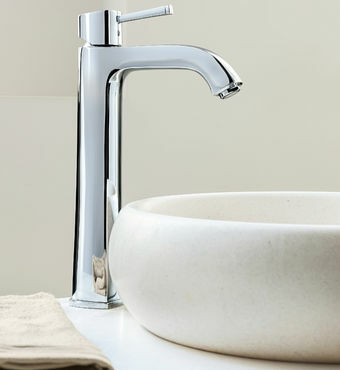 As the spout height and projection of a standard basin mixer may not be high enough to reach over the side of the basin, choose either a wall-mounted tap or a vessel basin tap. Whereas a wall-mounted basin tap requires the pipework and tap body to be concealed in the wall – not always an option – vessel basin taps are mounted on the surface that surrounds the basin. And because the location of a vessel basin tap is not predetermined by any mounting holes in the basin itself, you can choose the position best matched to your comfort and design requirements. Locating the tap centrally behind the basin may be the obvious choice, but why not consider mounting it off-centre, or at the side of the basin and use its elegant form to make a design statement? Tall basin taps for vessel basins can be found in the majority of our bathroom tap collections, ensuring perfect design coordination with our range of bath taps, showers and flush actuation plates.